Italian American Community Mourns Passing of Pino Cicala | Ciao Washington! On Monday morning, April 10, 2017, our good friend Pino Cicala passed away at his home in Foggy Bottom, Washington, DC. Pino was so much a part of our Italian American community in the Nation’s Capital for so many years that it’s hard to imagine the depth of the loss. In the coming days, we will be recalling Pino and his contributions to Washington, DC and beyond. Here is the first article, which appeared in Voce Italiana in January 2008, on the occasion of the 50th Anniversary of Pino’s “Italian Melodies” radio program. 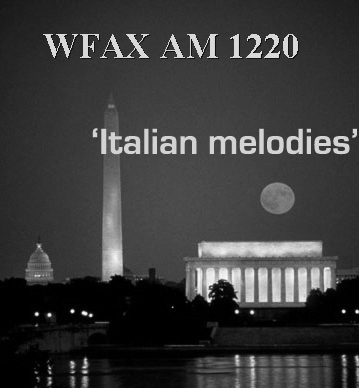 For half a century Pino Cicala, a Voce Italiana Board Member and Holy Rosary Church parishioner has invited Italian Americans, and friends of Italian music and culture, to enjoy the sounds of his “Italian Melodies” radio program, now broadcast every Sunday at 2 pm on WFAX-120 AM radio. Born in Italy, and immigrating to the United States in 1955, Pino enrolled in Catholic University’s School of Architecture, from which he received his degree in 1960. On Columbus Day 1958, while still a student at Catholic University, he first became the producer and host of the “Italian Melodies Hour.” The program was actually founded four years earlier by Pino’s brother Carmelo Cicala, who felt that the Italian American community in the Washington area needed an Italian voice. Pino recalled recently that in those early years, the song “Volare” had become internationally popular, thereby launching Italian music worldwide. The Italian community in the area was also very new, Pino says, and many needed help in understanding American culture, even basic information such as the significance of American holidays like Thanksgiving Day and the Fourth of July. “Italian Melodies was there offering help and information and also providing a link to Italy,” said Pino. Today, Italian Melodies hour is being “streamed” on the internet and Pino is considering establishing an archive, from which the program can be accessed at any time. Over the years, Italian Melodies has been at the forefront of broadcasting new talent from Italy. Aside from regularly featuring songs from the Sanremo Festival, said Pino, “I was playing Andrea Bocelli in 1984, long before anyone knew of his existence. He also introduced Cinquetti, DiBari, Celentano, Mina, Peppino di Capri, Paoli. Vanoni, Fiorello, Mannoia, and many more. In the operatic field, Pino has played Beniamino Gigli, Di Stefano, Pavarotti, Freni, Callas, Tebaldi, Licitra, and even recordings of Caruso. He selects the records in response to requests and “to balance the content to create a complete picture or to relate to particular events and festivities, such as Carnevale or Natale,” Pino said. Italian Melodies has not just been about music, however. Over the years, the program has provided news from Italy, as well as national and local news of interest to the Italian community. For the program, Pino has also personally interviewed nearly every Italian VIP who has visited Washington, D.C. (“Tutti quelli che sono passati da qui,” as he recently recalled.) Among his most memorable interviews, he said, were those with former Italian Premier Andreotti, former Attorney General Benjamin Civilletti, FIAT Chairman, Giovanni Agnello, and Watergate’s architect Luigi Moretti. He added that there were numerous other unforgettable interviews, including his very first in 1959 with Anna Maria Alberghetti, and subsequent ones with Italian singers, Enzo Stuarti, Nino Manfredi, Luciano Pavarotti, and Renzo Arbori. Pino Cicala’s personal library contains decades of Italian American records, history, and memorabilia. His media archives are comprised of broadcast, radio, television and music that spans a half century. Using his personal collections, Pino shares his love for the Italian community through the Italian Melodies radio program. He also maintains the Amico website (www.italianamericancommunications.org). Pino Cicala remains vital and active in the Italian American community. He is a member of, and has had prominent leadership positions in groups including The Lido Civic Club, the Italian Cultural Society, Friendship Heights Rotary Club, and The Roma and Fiumedinisi lodges of the Sons of Italy. He has received numerous awards of recognition, including three commendations from the government of Italy. In 2006, he was selected as the Lido Club’s Man of the Year. After a 30-year career in architecture, Pino has retired as President of Watergate Architectural Interiors.